Dīzeļdegvielas sistēmas attīrītājs - K2, 50ml. This product from first use, perfectly cleans the whole fuel system. 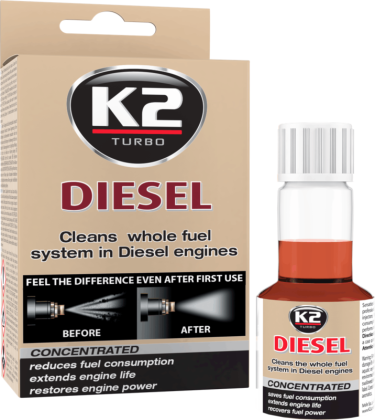 Decreases fuel consumption and emission of toxic flue gas as well as restoring full engine power. Facilitates starting and increases engine life. To be applied only to Diesel engines.